Chef Robin Song is one of the best cooking teachers I know. I keep telling him he should do it more often for interested home cooks, but he has his hands full consulting for a few different restaurants and trying to open one of his own. So for now I'll take all of his wisdom for myself.... and then share it here with you. One of San Francisco's rising star chefs and the talent behind upcoming Korean restaurant Junju, Chef Song is patient, knowledgeable, and — above all — has a drive to demystify cooking for the home cook. In his world view, cooking good, simple food is just that: simple. And it all starts with the best produce you can get your hands on. 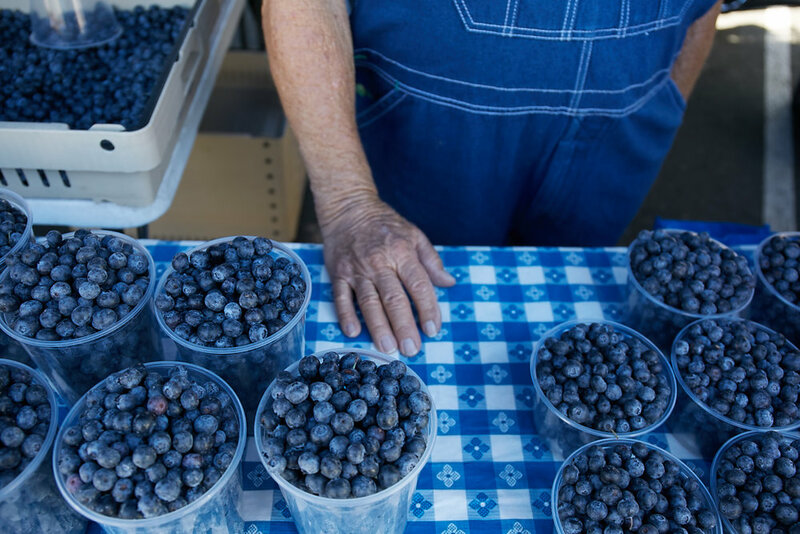 If you're lucky enough to live by a farmer's market (or dozens, as we are in the Bay Area) Song says the hardest part of cooking good food is actually getting there, choosing the right stuff and getting home. Song goes to the Marin Farmer's market twice a week. Here are some of the lessons he imparts. 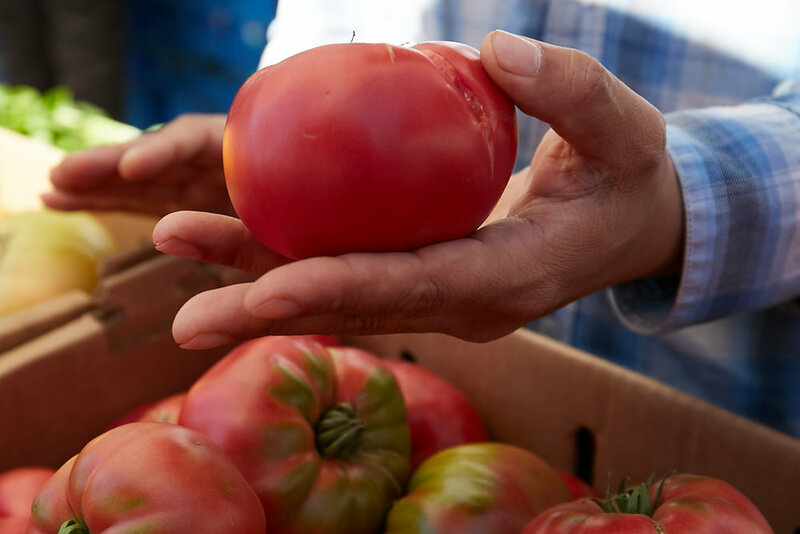 What's your #1 strategy for choosing the best produce and not over shopping at the farmer's market? I always make one round around the farmer’s market to take a mental note of what everyone has. Then I come back to buy things. This way I know I'm getting the best stuff and not worrying about missing out on anything. How do you pick vegetables? For vegetables, I go by look. If it looks delicious to me, then they usually are. I gauge it by whether or not I would eat it raw. If it looks like I would want to eat it raw, than chances are it will be delicious. Do you taste fruits before you buy them? Not often. I think fruits do benefit from tasting sometimes, but smelling is the best way to test if something is going to be good. You're smelling for the sweetness. If they’re really sweet and ripe, you can smell it through the skin. I actually hate raw tomatoes. So I prefer dry-farmed Early Girls. I think they have the most flavor and the most punch. For tomatoes, you have to do a combination of smelling and looking. They should smell very tomato-y and have shiny, beautiful skins. If you're going to eat them right away, they should have a good amount of give when you feel them. If you want to wait a couple of days, buy ones that are firmer to the touch. Do you have favorite vendors? No, because every farm changes all the time. It’s never the same — there’s so much variance on weather, water, terroir. You think about terroir in produce? Oh yeah. We talk about that a lot in wine, but never in food and that’s really important. Stone fruits, for example, are always a good barometer. There will be different peaches that are ripe every week. And every year it varies. Sometimes the white peaches are amazing, sometime the yellow peaches are good, and sometimes the apricots are the best. So on really wet or dry years, you’ll notice it in the fruits — they'll be more or less tart or sweet. How much do you think set up and organization at each farmer's stall affect what you buy? I think, in retail, merchandising is always key. Some play with that more than others. Fully Belly Farm does a good job of displaying their things. Everything looks beautiful. It helps if the stand is easy to navigate. How do you avoid buying more than you'll actually eat? I follow the rule that less is always more. The average person does not need to each that much food. And it’s easy to get carried away at the farmer’s market — especially in the summer when everything is beautiful. So I get a realistic view of how much people will eat. If I'm shopping for a dinner party where people are socializing, I'll assume that people are going to eat less. My gauge is a couple of tablespoons per person for each ingredient. If you’re shopping for yourself, you really need a game plan for what you'll cook with the ingredients. Come with 2 or 3 recipes in mind. What’s realistic for you on any given week? I always have this idea of shopping for a week’s worth of smoothies, but I rarely do that. So it's always managing what you want to do with what you’ll actually do. Will you cook for 3 meals or 5? Just be honest with yourself and buy what you’ll eat. How do you not get overwhelmed with all the gorgeous produce? In the heat of the season, you want it all. You have to keep in mind seasonality and talk to your farmer. Ask about how much longer the season is for a particular fruit or vegetable and if it’s the last week, you know it’s the best time to eat it. If it’s the first week of harvest, wait it out a couple of weeks to let it reach peak ripeness. So talk to the farmer is a big piece of advice. What else can you learn from the farmer? They can help guide you to tell you how much longer an ingredient will be available, how to use it in a recipe and they can even help pick the fruits for you when you feel nervous. There’s no better person to help you pick the best ingredient than the person who grew it. Any last tips on how to store produce when you get home? Never refrigerate tomatoes. It’ll make them mealy. Corn can be stored room temperature for a couple of days. Most produce can survive at room temperature. Once they come out of the ground they’ll start fading, but they'll be fine up to a day or two easily. Fruits can stay out up to a week. Herbs and green you want to keep them cool in a bag or contender with a bit of moisture.